Deliveroo/GettyDeliveroo CEO Will Shu and Uber boss Dara Khosrowshahi. Uber’s plan to buy UK food delivery startup Deliveroo has stalled because the two companies are “miles apart” on Deliveroo’s valuation, the Financial Times reports. Uber reportedly offered less than the company’s current $US2 billion valuation, while Deliveroo is pushing for $US4 billion. Uber’s ambition to acquire the company, a direct competitor with its Uber Eats delivery service, was first reported in September. Uber’s plan to acquire or invest in the hugely popular UK food delivery startup Deliveroo has hit a snag. The Financial Times reported on Wednesday that the two companies are “miles apart” on Deliveroo’s valuation after months of talks. 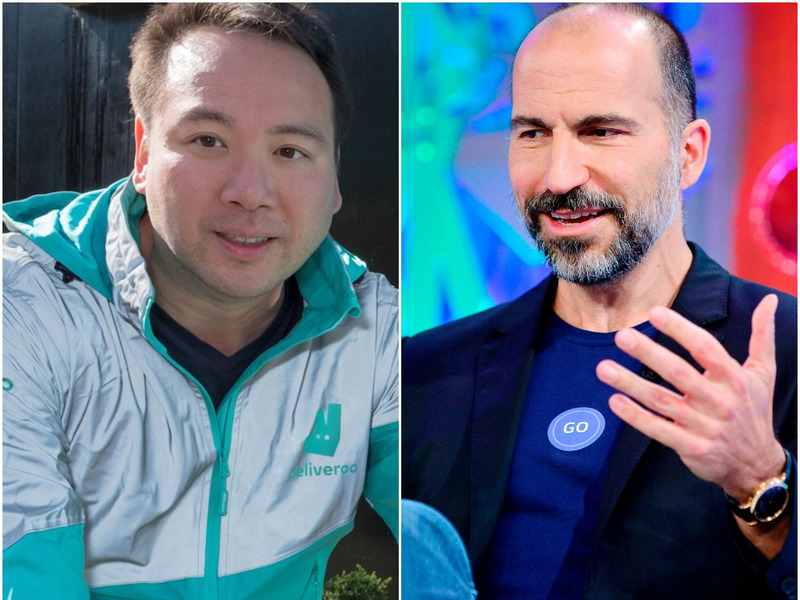 People briefed on the discussions said a recent offer from Uber valued Deliveroo at less than $US2 billion, a valuation it achieved in funds raised last year. Deliveroo, meanwhile, is reportedly set on a $US4 billion valuation. The FT’s update on the deal follows a Sky News report over the weekend, which said Deliveroo is trying to raise between $US350 million and $US500 million for a valuation of between $US3 billion and $US4 billion. A person familiar with the matter confirmed this to the FT, saying it’s looking to raise $US400 million at a $US4 billion valuation. It was first reported in September that Uber was in talks to buy Deliveroo, which was founded in 2013. Deliveroo is a direct competitor to Uber’s delivery service Uber Eats, which has only been in the UK since 2016. A Deliveroo spokesman told Business Insider: “This is just yet more speculation and Deliveroo does not comment on speculation.” Uber declined to comment when contacted by Business Insider. Meanwhile, in an interview with Business Insider in October,Deliveroo CEO Will Shu said his company is not for sale. “Deliveroo is the fastest-growing company in Europe, so people love to chat about us,” he said.